What is Blueberry Cobbler? It is a traditional American baked dessert. It consists of a filling which is placed in a large baking dish or several small individual dishes. It is then covered by a layer of pastry as a crust. The result is then baked. Cobblers are generally filled with fresh fruit, most commonly apples, peaches, blueberries and cherries. A cobbler is similar to a pie, but lacks the bottom crust. Sometimes the top crust can be a single piece of pastry or a pastry crumble. Either way, it is always delicious served warm from the oven with a scoop of vanilla ice cream! 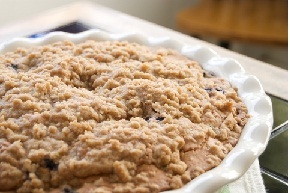 We have collected several different Blueberry Cobbler recipes. We hope you enjoy each and every bite! Looking For Dessert Recipes That Will Have Your Guests Coming Back for More and More!